John Kelly was a prime example of “local boy makes good.” He joined the Connecticut State Police when it was tiny but suddenly expanding agency, and wound up three decades later as head of the entire state police force. One of eight children, John Cornelius Kelly was born in Ridgefield in 1895. His paternal grandparents, Mr. and Mrs. Patrick Kelly, were among the first Catholic families to settle here. When World War I broke out, he enlisted in the Navy and served on submarine chasers. Around 1920, he joined the state motor vehicle patrol, a motorcycle unit that enforced laws dealing with the increasingly popular automobiles, but more particularly, the increasing dangerous trucks. In 1921, the motor vehicle patrol became part of the rapidly expanding Connecticut State Police. The state police had been established in 1903, but had only five men covering all of Connecticut. The force wasn’t much larger than that by 1920, but the enactment of Prohibition that year meant a manifold increase in the need for law enforcement, particularly in Connecticut’s smaller towns. 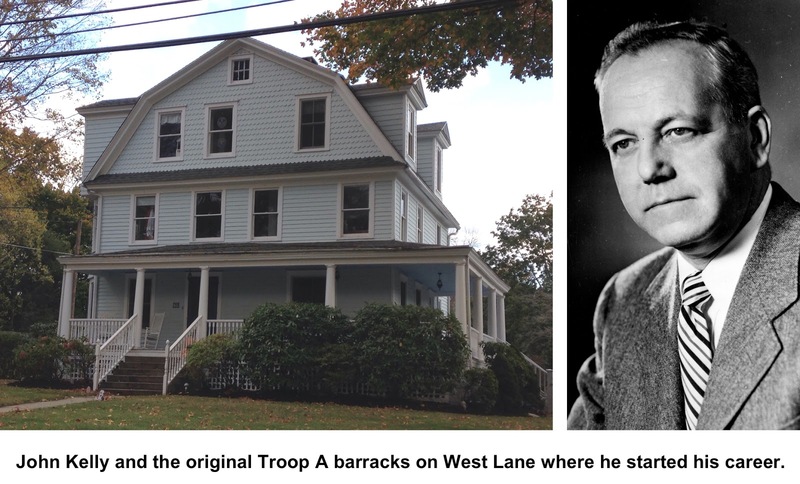 Kelly was quickly recognized as a leader and, in 1922, he was promoted to sergeant and given command of the new Ridgefield barracks, located on West Lane. In 1927 the barracks moved to a larger building on East Ridge Road — what’s now the Ridgefield Police headquarters. 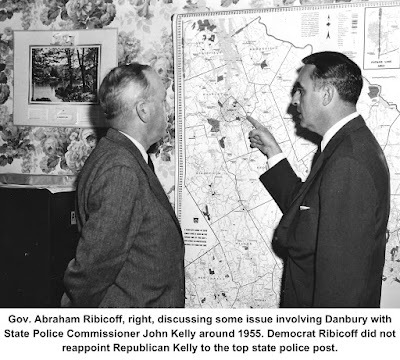 By 1931, Kelly was instruction officer for the whole state and in 1945, he was made a major and executive officer of the state police department. Four years later, he was named chairman of the State Liquor Control Commission. the equivalent of a chief of police, a command he held until 1955. He might have held the office longer, but Kelly was a Republican and by then the governor, who made the appointments, was Abraham Ribicoff, a Democrat. After his retirement, he served several terms as a state representative from Ridgefield to the Legislature. After that, he worked as a legislative consultant until he was 82. He died in 1984 at the age of 88, still living in the town in which he was born. 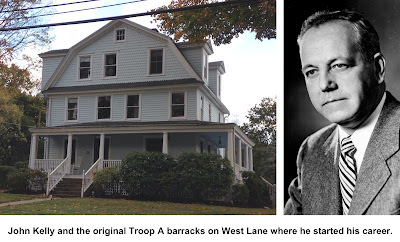 In a bit of irony, two of the leading law enforcement officials in the state during the 40s and 50s lived next door to each other on Wilton Road West: Kelly’s next door neighbor was Leo F. Carroll, who became second in command of the state police when Kelly was commissioner. Both started out together at Troop A when the barracks was on West Lane, and rose through the ranks — with Kelly always one step ahead.